People of Ninte, a community in Jema’a Local Government Area of Kaduna State, has rejected a renovated Primary Healthcare Centre (PHC) located in the community due to poor job quality. The community rejected the facility during a Town Hall Meeting organised by an NGO, Connected Development (CODE), on Thursday to discuss issues surrounding the status of the health centre. 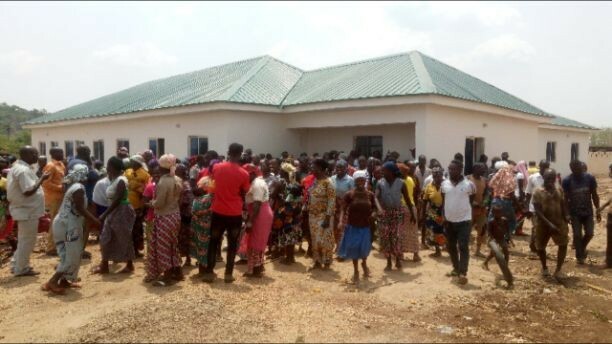 The Village Head of the community, Hassan Jatau said, the centre, renovated by Seramon-T Concept Ltd., was of low standard befitting a healthcare centre like the one in his community saying, the quality of paint used was poor while the electrical cables and the wiring were bad. “And the doors were made with ceiling board that we had to stop the contractor from installing them. “The toilets were also in bad shape and the soakaway was dug and left open, including the staff quarters left with no doors and toilet facility uncompleted,” the traditional ruler. If accepted, the facility will not last long before it will require another renovation which will not be good for the community having suffered for about two years without health centre, the village head has said. According to him, the health facility was burnt in May 2016 during an attacked on the community by gunmen that left seven people death and several persons injured. He said that after the incident, the community of over 7,000 people was left without a health facility and were forced to travel about 37 kilometres to nearby facility in Godogodo. “It was to reduce our suffering that the Jema’a Local Government Council in December 2017 awarded the contract for the renovation of the facility and staff quarters and expected to be completed by Feb. 9, 2018. “To our surprised, we saw on the news that the project has been completed. This is unacceptable,’’ he said. “Most of our people, particularly women and children are down with typhoid fever and other waterborne related diseases due to lack of access to clean water. “Besides, most health centres are built along with water facility, but our case is different. How would a health facility function with no water?’’ he asked rhetorically. He called on the local government council and the state government to intervene and put an end to their misery. On his part, the community Youth Leader, Mr Adamu Habu, who also noted the shoddy job, said: “The renovation of the health centre was badly done because we are villagers and as such, don’t deserve the best. “But we know our rights, thanks to Connected Development and other NGOs and civil society organisations who consistently enlighten us on the need to monitor government projects sited in our area. “We are the beneficiaries of this project and we will be the ones to suffer if we accept a badly done job like this,’’ Habu said. Also, Mrs Ladi Kagoma, who spoke on behalf of women, also called on the state government to intervene to save women and children from avoidable death to lack of a health facility. Earlier, Mr Kinsley Agu, the CODE Project Assistant, explained that the NGO was committed to giving voice to the voiceless, particularly on access to health services, education and sanitation. Agu said that although Kaduna State Government has signed on to Open Governance Partnership (OGP) that would ensure access to information, local government officials are frustrating the effort. “This is because all effort to get the Bill of Quantity of the project from the Jema’a council was unsuccessful.